However, other countries are taking the lead and doing their part. Vietnam is an emerging country with lots of challenges due to its mountainous terrain, growing population and rapid economic development. Yet, Hanoi was specifically mentioned at the conference by Dr. Shannon as a city showing leadership in the “waste to energy” space. At the conference, Giles Dickson highlighted the positive windfall (!) of the wind energy sector: including 263,000 jobs, €75 billion turnover, €36 billion contribution and responsibility for 12% of all electricity consumed in the EU. This equates to approximately half of the chemical industry’s contribution in the EU. Patrick Devine Wright reinforced the point that we need to not just look for tech solutions, but socio-tech solutions to bring together people and technology. On this, let’s not forget that Enterprise Ireland offers the Innovation Partnership. The Partnership is an opportunity to collaborate with universities to commercialise innovative ideas. Government agencies are well aware of the fact that the stakes are high. At the conference, Marie Donnelly gave us a clear example of that: the housing stock in Ireland is turned over once every 25 years. Therefore, we have one bite at the cherry to replace all fossil fuels, for cooking and heating, to electricity by 2050. Think of all the suppliers who have the opportunity to sell into this market! Dr. Shannon identified the three levers (i.e. buildings, waste and cars) that cities need to focus on, in order to become much more environmentally friendly. Jackie Quinn told us about the “Drive for Zero” campaign in Cork that grow its impact through incentives such as free tolls and parking, local political support and constant communication. The term “statement” sounds like something that one might say, but instead, it’s something that’s designed to guide action. 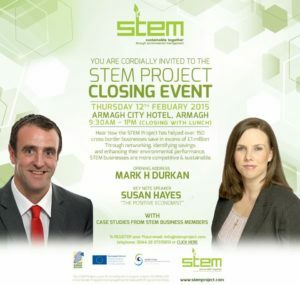 The post No, it’s not too late for the planet: EirGrid Conference, October 2018 – Susan HayesCulleton as MC appeared first on “The Positive Economist” Financial – Economics – Fintech & Entrepreneurship Articles.